PixelHealer is a free portable program for the Windows operating system that provides you with tools to detect and sometimes repair dead or defective pixels on the display connect to the machine you are using. LCD screens may have defective pixels which you sometimes may notice right away depending on their location on the screen and spread across the device. Pixels can either be stuck or dead with the core difference between the two being that dead pixels are black all the time while stuck pixels may show other colors as well depending on their state. It is sometimes possible to repair defective pixels on a monitor, especially if the pixel is stuck. Several methods are known that may unstuck pixels, for instance rubbing the screen, cycling through colors rapidly or simply waiting as stuck pixels may go away automatically sometimes as well. PixelHealer provides you with the means to try and revive defective pixels by cycling through colors rapidly in the area they are in. The program does not identify defective pixels on the screen which means that it is only of use if you have detected stuck or dead pixels already on it. PixelHealer is a portable program that you can run from any location on the device. It displays an always on top configuration menu that you use to configure its behavior. Basically, it lets you select the size of the area that you want to cycle colors through, the flashing colors that you want it to cycle through, and the time you want it to run. You may move the pixel block around on the screen and need to make sure that it covers the defective pixel when you drop it. 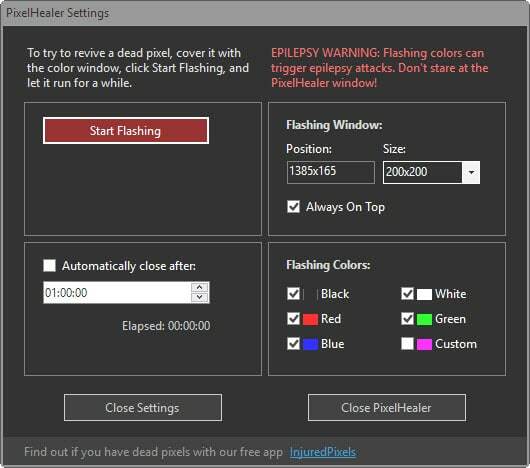 The selected area will flash rapidly, and the developer notes that one should not look directly at the area as it may trigger epilepsy attacks. Considering that the program is set to run until you stop it by default, it may be best to run it at a time where you are not using the computer at all. PixelHealer will run until you stop it or, if you have selected a time you want it to run in the configuration window, when it has run its course. The program is well designed and while there is no guarantee that it will repair defective pixels, it may be worth a shot considering that the only other options you have are to return the screen/buy a new one or to live with it. A user can try out more other options that are available in d “Solid Colors” section of “desktop background”. The above trick would help find the said “defective pixels” in d 1st time. You can also consider buying an IPS based screen, which would provide BETTER quality and performance of d comp monitor to U. The same company makes another free utility called “InjuredPixels” that tests for and identifies dead or stuck pixels. Meh, when I buy a screen, I buy it online, check the screen as it comes in, check/test it, if having dead pixels I send it back and buy the same one somewhere else. Rinse and repeat till I have a working monitor. In my country there is by law a 8 day return money back guarantee if bought in a shop, and a 15 day money back if bought online from day of delivery. Doesn’t matter why, they have to take it back. Some try to sell “pixel warranty” for like 15-20% of the price…. really? no thnx. Seems like a rather radical action to take for a single stuck/dead pixel, i could understand it if there were loads or it was in a noticeable place but wouldn’t the time/costs involved in sending back a monitor make it worth the 5-10min that it may take to wake or unstick the pixel? Seems very similar to UDpixel.